You're running late getting to the next job and the road is closed for roadworks. You've been cut off. There's some fool sitting in the right hand lane and won't move, even though they're aware you want to get past. You can feel the rage building in you like a pressure cooker and you have no idea how to stop it. Not fun, is it? Road rage is unfortunately very common. 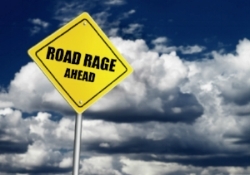 When a driver gets upset or loses their temper we call it road rage. Estimates are that over half the driving population has experienced some sort of road rage in their lives. It causes multitudes of accidents every year because of the aggressive driving and is also a leading cause of injury and death for young children. Barry Markell PhD says that one of the main causes are the crowded roads. "Rats are usually OK until there's one rat too many in an enclosed space and then they all turn on each other. There are far more people on the road than ever before. Crowding causes aggression." There are two types of road ragers. The first is the driver who has always driven aggressively and this behaviour is now habitual. The second is called situational road rage - this is the driver who has perhaps just broken up with his/her partner and is driving aggressively. One of the issues with people experiencing road rage is that they don't see the other driver as a person. They only see them as a thing. Road ragers don't see that these are people who have families and are perhaps just having a bad day. Many times road ragers have partners or friends who are terrified by the driver's aggression. They are unaware that there are many healthy and easy ways of releasing this very scary, pent up anger. The price of rage road rage can be very high. Rather than continue risking killing an innocent person, getting a ticket, damaging your vehicle or terrifying your passenger, come in and I'll show you how to let go of all that anger.